I had the opportunity to test drive the 2006 Honda Civic 1.8S and the 2006 Honda Civic 2.0S on a nice Saturday morning thanks to Jeremy and Shannon from the New Straits Times lifestyle section. This is part two of a three part series. Click here to read part 1. How’s the drive then? The 1.8S is supposed to tuned for comfort while the 2.0S is supposed to have a sportier suspension tuning, but I did not notice much difference with both cars. Both handle well with slight understeer. Most of the driving was done with 3 people in the car. I did not do anything crazy enough for the VSC to kick in. I preferred the 1.8S hydraulic steering rack rather than the 2.0S electronic power steering. But then again, I am someone who is used to heavy steerings. It might just be psychological, but the 2.0S has slightly less feel to it than the hydraulic one. This is comparing the two Civics of course. If compared to other Japanese makes, both the steering feel of both the 1.8S and 2.0S is so much better. It gives me the impression of a very well put together car, almost continental in character. Heavier than the usual Japanese sedan, but it gives the car an agile feel, pointing the nose wherever you’re steering it. 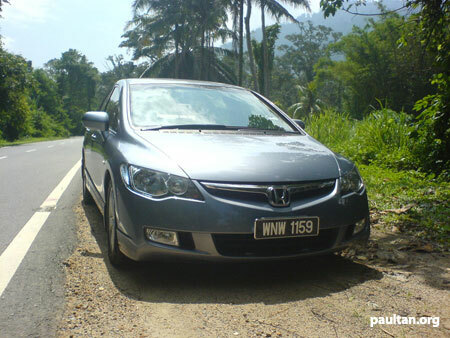 I took some semi spirited drives through some narrow bendy roads, tailing trailers and waiting for the best opportunity to overtake them, and discovered the Honda Civic handled pretty well. This was in the Civic 2.0S. Let’s put things into perspective. I can drive more â€œinsaneâ€ than how I did on the test drive day without much fuss in an old 1984 Nissan Sunny 130Y 1.5, and this Civic handled a lot better than the Sunny. So imagine once I was used to the Civic’s characteristics, what it could do. We also had a go on some slightly bumpy roads and damping was sufficient for a comfortable ride. There are reports of some strange noises with the Honda Civic’s front right suspension, but I did not detect any. Maybe Honda fixed it with these two cars, with them being test drive cars and all. However, this appears to be a very common problem with the 2006 Honda Civics, so be sure to check if your car has the problem. The Honda Civic is very very quiet. Which makes it excellent for sneaking up on road runners. In fact, if you turn off the air conditioner, you might think the engine is off from the inside of the car. It did not rain, and we didn’t have time to find a water hose to spray water on the roof of the car, so we could not check how quiet the cabin would be during rain. The boys from NST said they would check this out later. There was some slight noise from the tyre roll though, but this can be solved by using quiet touring tyres like Bridgetone’s Turanza. Torque was ample in the 1.8 model. I had a spot of town driving in that car. Very nice, very comfortable. Thanks to our beloved Works Minister Samy Vellu, I also had a go at a traffic jam near the Middle Ring Road. Car did fine there. Big wing mirrors made it easy to switch lanes. There is also a triangular gap near the A pillar which extended the driver’s field of view. This is important for the forward sloping A-pillar design, otherwise turning the car would be a mess. What makes this car so nice to drive in stop and go situations is the excellent feel that the accelerator pedal provides. The pedal is hinged at the bottom instead of the top. Somehow that design makes it much easier for me to control how much pressure is put on the accelerator pedal. I kind of like it, and understand how luxury cars like Mercedes Benz have been using this type of pedal for quite some time. 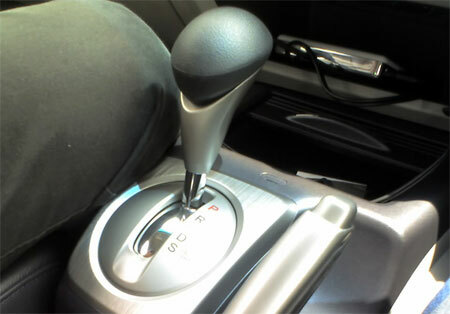 Have you ever driven a manual car where the clutch slips on hard acceleration? You feel the engine revving higher and higher but the car doesn’t really go anywhere. This was how I felt driving the Civic 1.8S with the R18A1 SOHC i-VTEC engine in a spot of spirited driving. The engine is useless through curves. 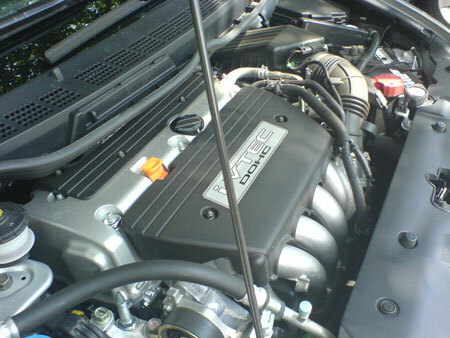 The engine has good low to mid torque, but practically nothing on the top end. It is supposed to have only 14Nm of torque less than the K20A in the Civic 2.0S, as well as only 15 horsepower less. But it feels like the world of a difference. Good for town driving, good for highway cruising, but anything else and it’s hopeless. Many times the gearbox had to drop gears twice to get enough power to go forward. My face showed obvious frustration with the engine that it merited a few chuckles from the passengers. But the engine is supposed to be as frugal as a 1.5 litre, so you can’t really complain much. It’s serving it’s purpose. It’s not a performance engine. The 2.0 litre K20A on the other hand, just kept screaming until the 6800rpm redline. It actually inspires you to push it to the max. The 1.8S has nothing above 4500rpm. Go past that mark and you start to feel there is no point, and you ease on the gas pedal to allow the gearbox to change to the next gear. 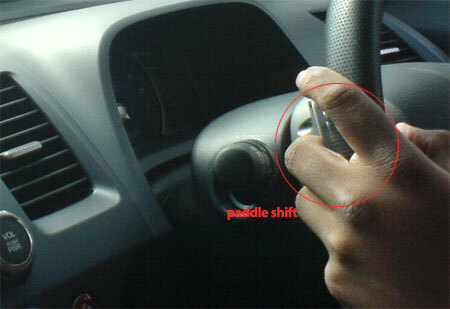 Shift to S fo the paddle shift feature. The 1.8S has the normal D, D3, 2, L.
Naturally once I got into the Civic 2.0S’s driver seat I was eager to try the paddle shift feature. So I shifted to S. I could hear the engine drop a gear. But where was the gear indicator? Then someone told me I had to shift a gear once first before it would enter paddle shift mode. I had totally forgot the gearbox had a sporty automatic mode which was the S mode. I did not test that out in the anticipation of testing out the paddle shift mode. Silly me. Paddle shifting was very responsive, better than what I expected from an automatic transmission. But I had a few gripes. First of all, I understand Honda designed the Multiplex two-tiered meter to help the driver focus on the road. And if I am in the paddle shift tiptronic mode, I’d most likely going to engage in a spot of very spirited driving. And this requires me to keep my eyes on the road even more. Even the paddle shifters exist to help me keep focus, with hands on the steering wheel shifting the gears instead of operating a plus and minus lever on the gear lever. If so, I cannot understand why Honda put the gear indicator at the bottom tier next to the RPM meter. Why not the top tier? I couldn’t even see the gear indicator in some cases where the steering wheel spokes were blocking it. Honda, if you ever facelift the car, please relocate the paddle shift gear indicator to the top tier of the Multiplex dashboard. There’s plenty of space. If you want to do something, (help the driver focus in this case) do it right, don’t do it half way and make the whole thing a pointless gimmick. I’m not saying it’s a gimmick, the Multiplex meter is very functional, but it could be improved. I had great fun playing with the paddle shifter. There were a few times where I accidentally hit the wiper controls though. 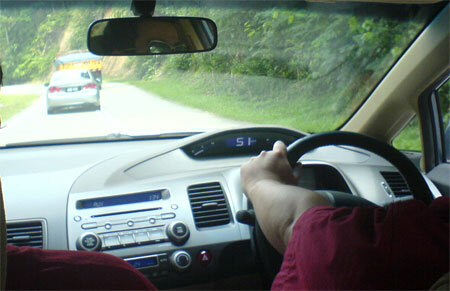 Highway driving is very relaxed on both cars thanks to the 5-speed gearbox where 2 of the gears are overdrive gears. But I would have preferred 4 gears with 1 overdrive for more acceleration power. The Civic is beautiful on highway cruising. So stable. I was flooring the Civic 1.8S on the highway to see how it could go and before I knew it, I was touching almost 160km/h. To be honest it didn’t feel like anything above 120km/h, and I am not exaggerating here. You tend to speed in this car without even realising it because normal highway cruising speeds feel slow in it. A solid chassis perfect for a DC5 engine transplant. It’s almost a crime putting something weak like the R18A1 1.8 engine in it. Brakes were good, but somehow the ABS did not activate. I’m not sure if I was doing it wrong. I was going 70km/h on a straight road and jammed the brakes. I did not warn Jeremy and Dr. Long first, sorry guys. The rear tailed abit, and the front tyres skidded abit. No ABS. No pulsing feel in the brake pedal. Do I have to be going 170km/h? Sorry, an ABS newbie here. I do not have a car with ABS. Next up – conclusion and what I think of the car’s build quality as well as which I would pick – the 1.8S or the 2.0S? Click here to read part 1.